Last, but not least, in my series of posts examining the results of the Toronto municipal election of October 2014, are Wards 43 and 44, Scarborough East. I started these series of maps of the 2014 Toronto election as a few tweets. To me, it was a simple, interesting exercise. At first, I only sought to map the most interesting wards, where there were competitive races for city council – wards where the incumbent wasn’t running again, or where great candidates like Alejandra Bravo, Russ Ford, Lekan Olawoye, Dan Fox, and Andray Domise, were taking on established councillors and offering a better alternative to local voters. After requests to have a place to have these maps available somewhere, I resolved to set up a blog and to map every poll. It has taken me a bit longer than I expected, but I hope that these maps become useful between now and the 2018 election. While my politics certainly lean left, and my commentary on my blog at times pointed, all the maps I created are available to everyone. Despite my cynicism, I genuinely believe most people run for public office for the right reasons. Putting your name on the ballot takes courage; making a serious run for any elected office, even school trustee, is a long, difficult, exhausting, and expensive undertaking. I respect nearly every candidate who make that effort, regardless of their political leanings. And now, with the ward maps done, I’ve thought of more ideas to pursue in the near future. I’m interested in voter turnout; with esteemed Ryerson Professor Myer Siemiatycki, I co-wrote a study commissioned by the Maytree Foundation studying voter turnout in previous municipal elections. With poll-level data, it would be most interesting to look at voter turnout by housing type (such as TCHC vs. private rentals vs. condominium residences, for example) and other local determinants. Ward 43 is represented by Paul Ainslie, a centre-right leaning councillor who I’ve come to respect. Ainslie was picked Chair of the Government Management Committee (and a member of Mayor Rob Ford’s executive committee) after the 2010 election. The calls were made from Ford’s own City Hall telephone number. Eventually, Mayor Ford was forced to apologize on the council floor in 2014, in one of many rulings the City’s integrity commissioner made against the mayor. Despite Ford’s outrageous claims, Ainslie regularly engages with his constituents, including discussing the subway/LRT issue. As in neighbouring Scarborough Ward 36, most polls on the Lake Ontario shoreline in Ward 43 voted for John Tory. Conversely, all but one poll north of the GO Lakeshore East Line, a City of Toronto long term care home near Scarborough Centenary Hospital, voted for Doug Ford. Ford came in first place in Ward 43, netting 45.7% of the vote, while Tory came in second place with 35.3%. Olivia Chow only took 15.5% of the vote. 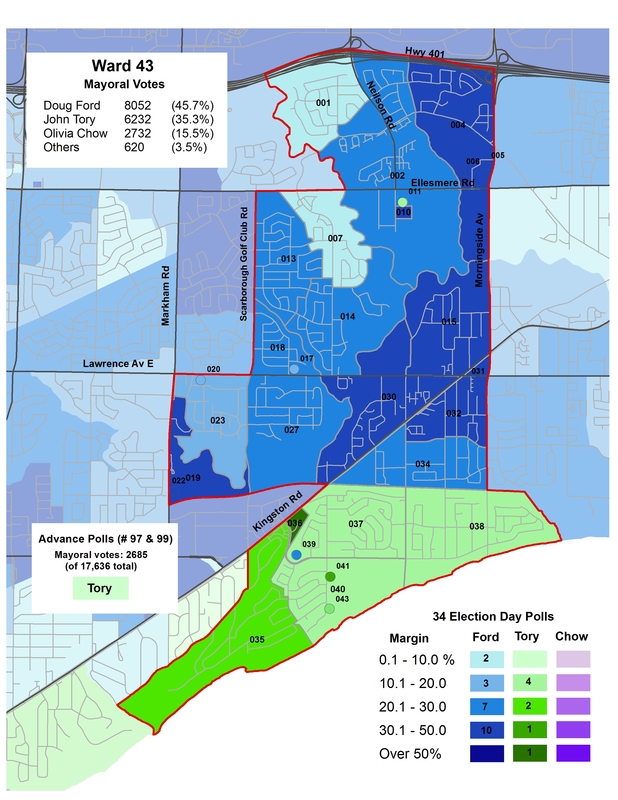 Paul Ainslie handily won re-election in 2014 (despite Rob Ford’s robocalls) with 74.3% of the vote. Second place candidate Mark Harris had the vote of only 10.5% of the electorate. 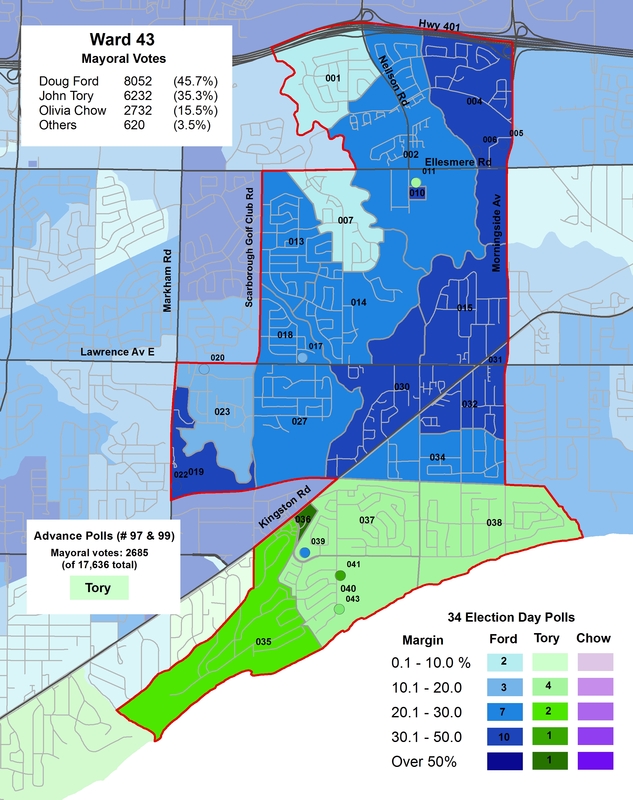 East of Highland Creek, the residential areas between Kingston Road/Highway 401 and the lake mostly voted for Tory, continuing Tory’s pattern of coming in first in middle and upper-income polls in Scarborough that straddle Lake Ontario. West of Highland Creek; Polls 027, 028 and 029, while also bordering Lake Ontario, are for all intents and purposes inland; the GO Lakeshore East line (CN Kingston Subdivision) separates residential areas to the north with the parks, factories and municipal facilities (water treatment plants). These polls, which supported Doug Ford by wide margins, are located in the West Hill Neighbourhood Improvement Area (the new nomenclature for what used to be called “priority neighbourhoods); Poll 027 includes the Danzig Street TCHC community where one of Toronto’s worst mass shootings occurred on Monday, July 16, 2012. Most polls north of Kingston Road also voted for Doug Ford. Ford came in first place in Ward 44, taking 44.1% of the vote to Tory’s 38.6%. Chow only got 14.9%. 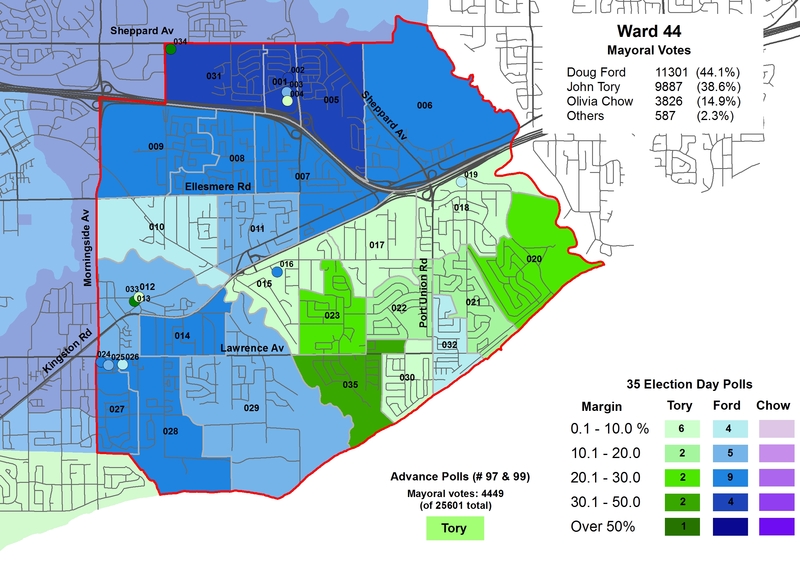 As in Ward 43, Tory won the advance poll by a comfortable margin despite coming in second place in both wards. 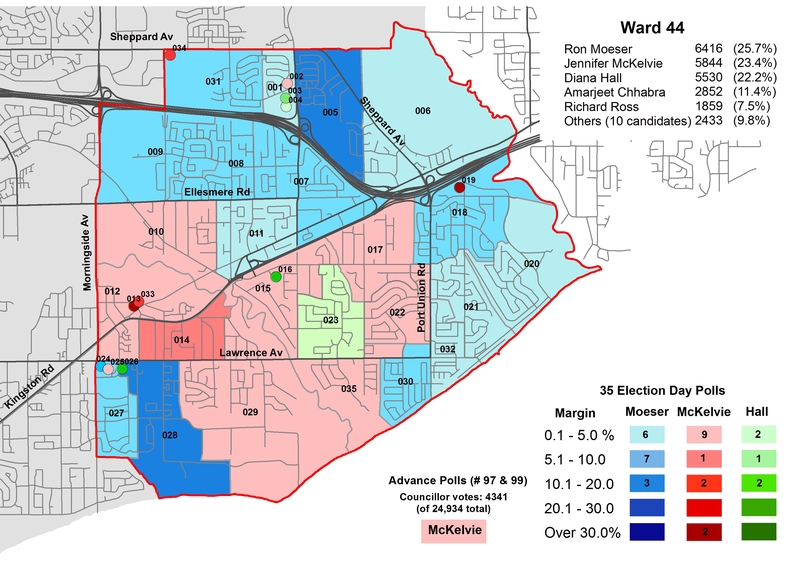 Ward 44 also had one of the closest council races as three viable candidates sought to unseat 71-year old Ron Moeser, who left everyone guessing whether he’d run for council again despite a poor attendance record attributed to health concerns. Moeser has long been a dead weight on council, quite possibly its least active member. Moeser was first elected to Scarborough council in 1988, he has been a city councillor since then, except betweeen 2003 and 2006, when Gay Cowbourne defeated him; she did not run again in 2006 and Moeser took back the seat. In the 2010 election, Moeser narrowly won in Ward 44, taking 47.4% of the vote to second-place Diana Hall’s 46.1%, a difference of 284 votes. In 2014, the Toronto Star endorsed Hall, Cowbourne’s former executive assistant, describing her as a “thoughtful conservative” while NOW Magazine halfheartedly endorsed Amarjeet Shhabra, explaining that the main reason to vote for her was to defeat Moeser. Shhabra, a union organizer, had the Labour Council’s endorsement. It’s too bad the Toronto Star and NOW overlooked Moeser’s strongest challenger. Moeser unfortunately won in a crowded field of 15 candidates; several of whom had name recognition and organized campaigns. But Moeser won just 25.7% of the vote in the 2014 election, 3769 fewer votes than in 2010. But was Jennifer McKelvie, an environmental scientist and adjunct professor at Ryerson University, who came closest to defeating Moeser, taking 23.4% of the vote, a difference of 572 votes. Hall came in third with 22.2%, and Chhabra came in fourth, netting 11.4% of the vote. McKelvie came in first in 14 election day polls as well as the advance poll, Moeser won in 16 polls, Hall in 5. Most polls that supported Doug Ford the strongest stuck with Moeser for council, while polls where Tory came in mostly voted for Hall or McKelvie, the remainder might have voted for Moeser, but by very small margins. Had there been a less crowded field, I suspect that Moeser would not have won in 2014. McKelvie, who was running for public office for the first time, has some impressive credentials; had she won, she’d be great fresh voice at City Hall. But in several wards, including 3, 5, and 26, the second-place candidate in the 2010 election went on to prevail in 2014. This should be welcome news for Jennifer McKelvie, who I hope will be interesting in running again. This entry was posted in Election, Maps and tagged 2014 Election, Scarborough, Ward 43, Ward 44. Bookmark the permalink. This is a ward where instant-runoff voting would almost certainly have resulted in a different outcome. Let’s hope it’s in place for the next election.